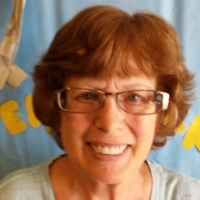 My name is Judy Ruckert and I have been a member of the Sloan Canyon Free Will Baptist Church for over seven years. I am excited to be the new Assistant to the Director and Teachers at the preschool. I was a volunteer in Miss Janet’s and Miss Trisha’s rooms for many years. I also had the pleasure of being a nanny for two years, until the child started preschool. I truly enjoy being around children every day. I was born in a small town in western Pennsylvania, which is why I am a big Pittsburgh Steelers fan. I have two grown daughters and four grandchildren ages 11-16. My interests include traveling, scrapbooking and camping with my family. Since I retired in 2010, I have taken my grandchildren camping in my motor home, traveled to fifteen countries, and visited 44 states. I drove cross country in my motorhome, visiting 16 states in seven weeks. I have a Silky Terrier named McGee. All of the children love him. We are both thrilled to be a part of the preschool.